Harrisburg scored four runs in the bottom of the sixth to take a 6-4 before holding on to beat the Indians in high school baseball action this past Monday in Harrisburg. Jarrett Harsson walked to lead off the game for Marked Tree and moved to second on a wild pitch as Brennon Honeycutt also drew a walk. Harsson moved to third on a passed ball before Honeycutt stole second base as the ball got past Jett Jackson allowing Harsson to score to make it 1-0 Indians. Eli McCrary struck out as Chaz Simmons doubled to plate Honeycutt making it 2-0. Zander Criswell popped out as Jackson Parrish reached on an error that scored Simmons making it 3-0 Indians. Jackson came on to pitch for Harrisburg as he struck out Braden Francis for the third out. Ross Heeb struck out leading off for the Hornets as Drew Wright drew a walk. Wright stole second base as Jackson grounded with Wright moving to third. Hayden Creecy legged out an infield hit that scored Wright making it 3-1 Marked Tree. Conner Castle grounded ending the inning. 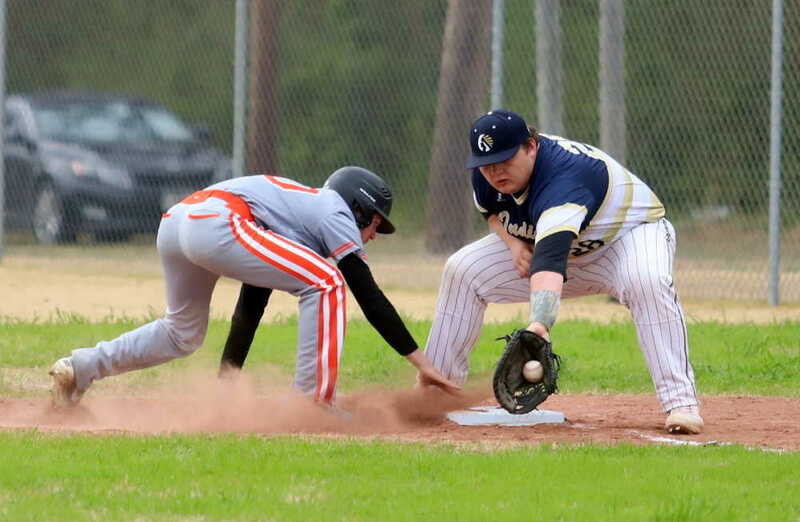 Aiden McGuire singled to start the second inning for the Indians and went to second as right fielder Jamason King tried to throw McGuire out at first base. McGuire stole third base before Logan Smith singled to plate McGuire making it 4-1 Indians. Harsson and Honeycutt both struck out looking as McCrary’s fielders’ choice grounder forced Smith at second base. Harrisburg went down in order in the bottom of the second as Parker Jones and Jaden Gipson both went down looking and Presley Witt grounded out to keep the score 4-1 Marked Tree. Full game story in April 4 edition of the PCDT on newsstands now!